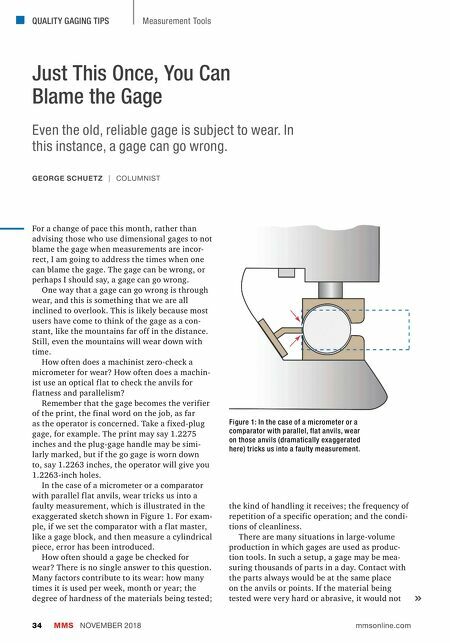 MMS NOVEMBER 2018 34 mmsonline.com QUALITY GAGING TIPS Measurement Tools Just This Once, You Can Blame the Gage GEORGE SCHUETZ | COLUMNIST Even the old, reliable gage is subject to wear. In this instance, a gage can go wrong. For a change of pace this month, rather than advising those who use dimensional gages to not blame the gage when measurements are incor- rect, I am going to address the times when one can blame the gage. The gage can be wrong, or perhaps I should say, a gage can go wrong. One way that a gage can go wrong is through wear, and this is something that we are all inclined to overlook. This is likely because most users have come to think of the gage as a con- stant, like the mountains far off in the distance. Still, even the mountains will wear down with time. How often does a machinist zero-check a micrometer for wear? How often does a machin- ist use an optical f lat to check the anvils for f latness and parallelism? Remember that the gage becomes the verifier of the print, the final word on the job, as far as the operator is concerned. Take a fixed-plug gage, for example. The print may say 1.2275 inches and the plug-gage handle may be simi- larly marked, but if the go gage is worn down to, say 1.2263 inches, the operator will give you 1.2263-inch holes. In the case of a micrometer or a comparator with parallel f lat anvils, wear tricks us into a faulty measurement, which is illustrated in the exaggerated sketch shown in Figure 1. For exam- ple, if we set the comparator with a f lat master, like a gage block, and then measure a cylindrical piece, error has been introduced. How often should a gage be checked for wear? There is no single answer to this question. Many factors contribute to its wear: how many times it is used per week, month or year; the degree of hardness of the materials being tested; the kind of handling it receives; the frequency of repetition of a specific operation; and the condi- tions of cleanliness. 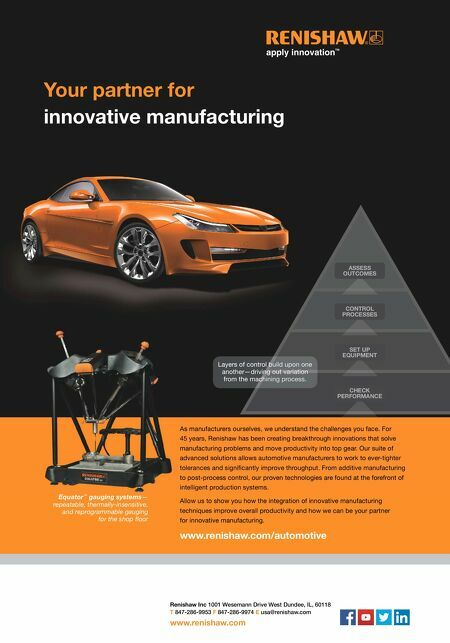 There are many situations in large-volume production in which gages are used as produc- tion tools. In such a setup, a gage may be mea- suring thousands of parts in a day. Contact with the parts always would be at the same place on the anvils or points. If the material being tested were very hard or abrasive, it would not Figure 1: In the case of a micrometer or a comparator with parallel, flat anvils, wear on those anvils (dramatically exaggerated here) tricks us into a faulty measurement.